There are several ways to focus on the biodiversity of a place and I’ve tried several in this fieldwork of Siwa oasis. The third is take an interest in a species, acknowledged as such by the classificatory botany science, to explore its rich intraspecific diversity: here, it was the study of the different date palm “varieties” or “cultivars”. The first two approaches are being written. The third is a research in progress. The intraspecific diversity of the Siwa date palm (Phoenix dactylifera L.). This approach required a long fieldwork in Egypt, ethnological work and sampling work (in Siwa, and around Siwa in the desert, in the oases abandoned at present time: see the sampling map below). This approach has also requested a very long bibliographical work (mainly conducted in New York ) and an interdisciplinary collaboration with colleagues from the Institute of Botany of Montpellier (Université Montpellier II Sciences et Techniques du Languedoc, Centre of Bio-Archaeology and Ecology, UMR 5059). Samples collected around Siwa were used for different purposes: to feed a PhD thesis on the origins of the date palm with data , also a Master’s thesis on the archaeobotanical tool invented around the date palm seed morphology  and collaborative research. I designed my work in two stages: the first was to write a (long) article on the agrobiodiversity of the date palm as it is possible to do it from ethnographic and ethnobotanical methods; this was the object of a first publication (in progress The agrobiodiversity of the Date Palm (Phoenix dactylifera L.) in Siwa Oasis (Egypt): between what is said, written, and forgotten) (delayed because Anthropobotanica Journal just disappeared, we expect the relocation of the article in another journal — Mémoires du Muséum national d’histoire naturelle? —; a pre-print version is at least available to download — Edit: since then, this long article has been published in the journal Revue d’ethnoécologie). It was also the object of a lecture (in 2012 at Oxford university, UK). The results are already very interesting. The second stage of this work is to write down collectively this time an article for Human Ecology journal which can draw some conclusions about theses multidisciplinary expertise around the date palms of Siwa: what can we say about the combination of ethnographies and morphogenetic analyzes? See: Date palm agrobiodiversity (Phoenix dactylifera L.) in Siwa oasis, Egypt: combining ethnography, morphometry, and genetics. A sequel to this first article in Human Ecology is in the process of being written with the same authors. In the meantime, an important article was published, but my contribution was less significant: The Discovery of Wild Date Palms in Oman Reveals a Complex Domestication History Involving Centers in the Middle East and Africa. Traité des arbres et arbustes que l’on cultive en France en pleine terre, 7 v. [1801-1819]: 498 col. pl. ; 42 cm. 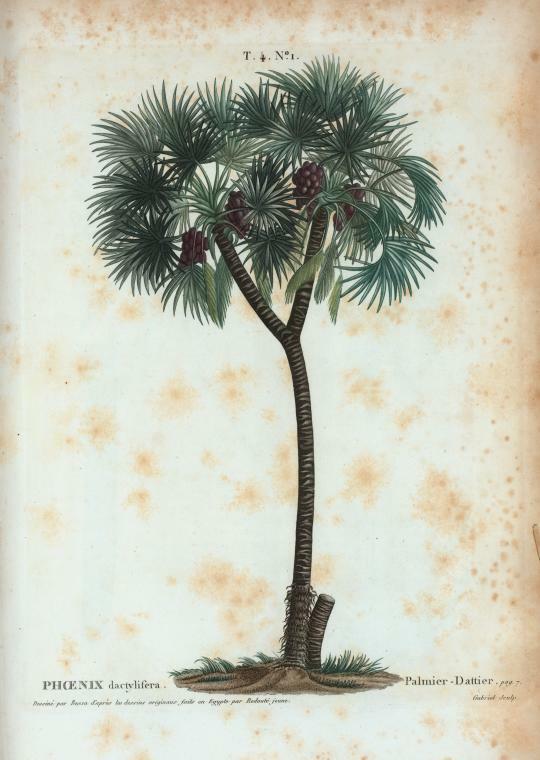 This is not a date palm, Phœnix dactylifera L., unlike the information given by the captation of this beautiful drawing, botany and scholarly-looking: the fruits of the date palm compose clusters of small fruits, its palms are feather-shaped (pinnated leaves) and not fan-shaped (palmed leaves) like on this image, and its stipe (the “trunck”) is never divided. These features suggest that this is most likely a representation of a doum palm (Hyphaene thebaica (L.) Mart., 1838). Gros-Balthazard, Muriel, 2012 — Sur les origines, l’histoire évolutive et biogéographique du palmier-dattier (Phoenix dactylifera L .): l’apport de la génétique et de la morphométrie. Doctorat PhD, Université Montpellier II Sciences et Techniques du Languedoc, École doctorale: Systèmes Intégrés en Biologie, Agronomie, Géosciences, Hydrosciences et Environnement (SIBAGHE), Montpellier, 377 p.
 Ogéron, Clémence, 2012 — Caractérisation morphométrique et ethnographique de l’agrobiodiversité du palmier dattier (Phoenix dactylifera L.) dans l’oasis de Siwa (Égypte). Master I thesis, Université Montpellier II Sciences et techniques du Languedoc, Centre de Bio-Archéologie et d’Écologie (UMR 5059) de l’Institut de Botanique de Montpellier, Montpellier, c, 17 pl., 24 p.
Dernière mise à jour de cette page le Friday 12 January 2018 à 14:54:37. //// -----> Citer cette page? Vincent Battesti, "Biodiversity & agrobiodiversity in Siwa oasis" [en ligne], in vbat.org anthropoasis, page publiée le 3 June 2006 [visitée le 16 April 2019], disponible sur: http://vbat.org/spip.php?article303.